You can only access them via this one exclusive property. 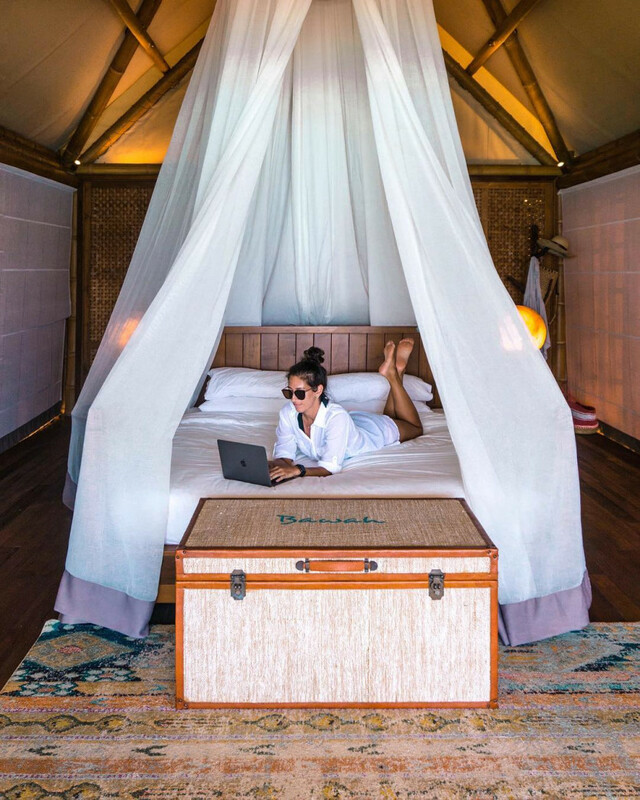 A single night on Bawah Island—one of six jewel-like land masses strewn across the South China Sea somewhere between the coasts of Malaysia and the island of Borneo—costs more than a month’s rent for my studio apartment in New York City. Which raises the question...how exactly did I end up there? I’m the kind of traveler who’s more likely to get psyched about spending $37 on a tree house in the middle of a rice field than I am to drop a couple hundred a night on a luxurious five-star hotel on the beach, but part of my job as a freelance travel writer is doing the very hard investigative journalism work of checking out new properties, like Bawah Reserve, which opened in January 2018. 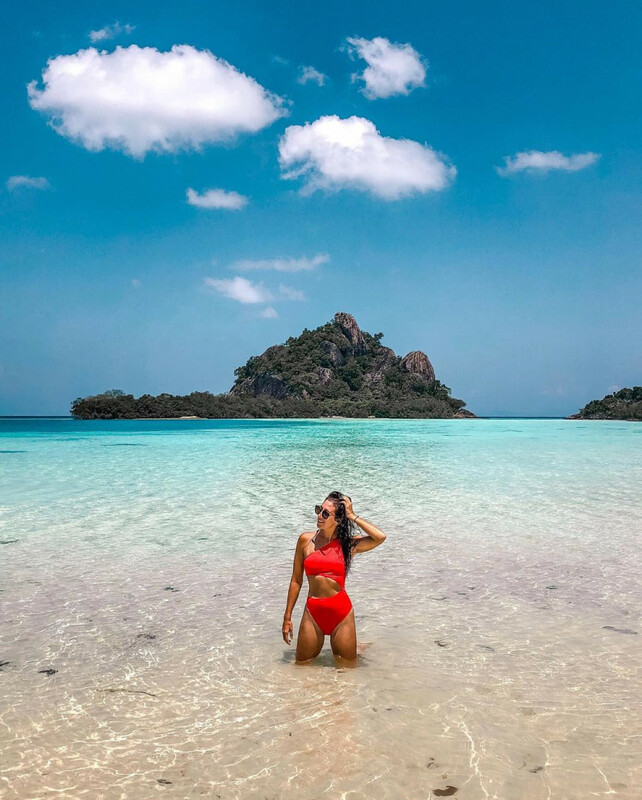 It’s the first property to ever bring tourists to this far-flung stretch of land, and it looks like the kind of place only the extremely rich and most ~extra~ travel influencers can afford—at $1,780 per night per couple, it might actually be that kind of place. But that’s the price you pay for going off the grid (without giving up any creature comforts). Fortunately, it’s an all-inclusive price that makes you feel like a baller even before you arrive at Bawah Island, via a private chauffeur who shuttles you from the Singapore airport or your hotel to a 40-minute ferry ride to Indonesia’s Batam Island, where you catch an 80-minute flight to Bawah Island itself. That’s literally the only part of the trip that doesn’t feel 100 percent glamorous. Once your seaplane touches down in one of the three aquamarine lagoons, it’s like stepping into a screensaver image. Two wood jetties converge to lead to a lush, mile-long island that looks a little like a mini version of Jurassic Park. The bright green palm trees hide traditional Indonesian thatched roofs covering an Asian-fusion restaurant, three bars, and a beachfront infinity pool. 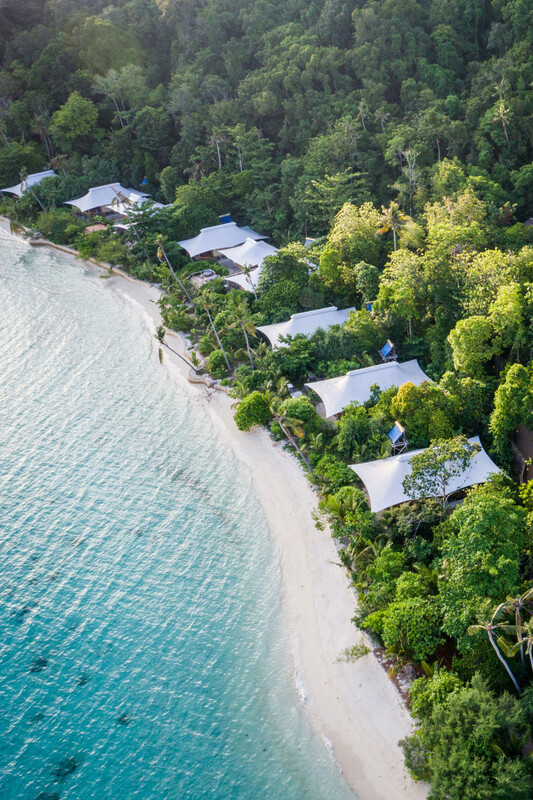 The toughest decision you’ll make during your entire trip to Bawah is the first one you’ll make: choosing which of the 35 bungalows to stay in. Half are safari-style beachfront bungalows, made from bamboo and teak and covered with a canvas tent. It was bigger than my studio apartment, with mosquito netting that somehow managed to make the bed feel positively regal, and a copper tub I soaked in three times despite the tropical heat and humidity. The other half of the bungalows are perched directly over the Evian-like water, with steps that descend right into the reef-lined lagoons. 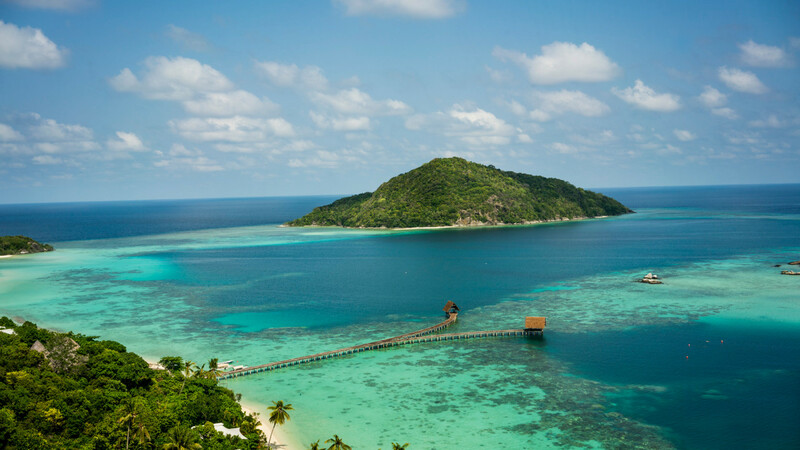 While Bawah Island is currently the only inhabited destination within Bawah Reserve, there are 13 barely touched beaches across the six islands, and the resort will arrange private excursions for scuba diving, snorkeling, stand-up paddleboarding, kayaking, or just straight-up lounging. Or you can see them all via a sunset boat tour while sipping champagne and snacking on canapés, because isn’t that just bougie AF? 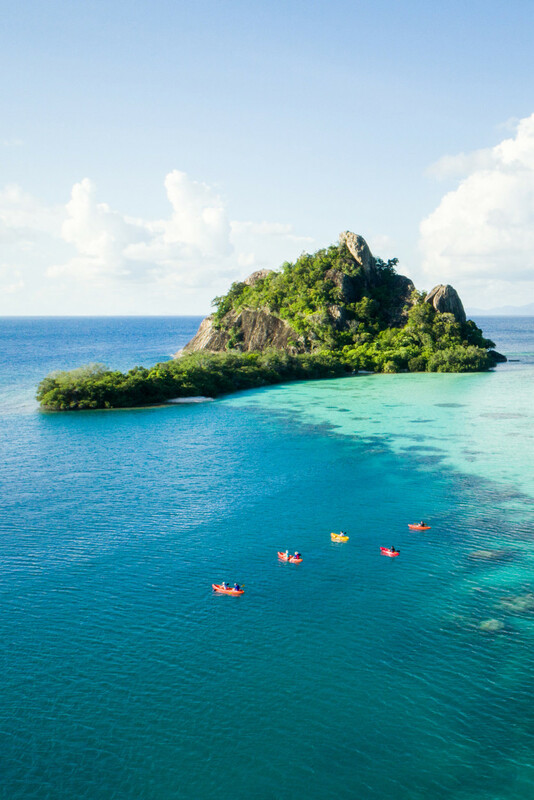 The best part: As indulgent as Bawah is for its guests, it’s actually part of the Bawah Anambas Foundation, which was created to channel funds back into the land, sea, and local community—especially since the archipelago itself is part of a marine conservation area. The resort aims to be as sustainable as possible, using ocean-friendly sunscreen, eco-friendly laundry detergent, and no plastic bottles on property; all waste is recycled, all paper is mulched, all food waste is composted, and crushed glass is used in the water-filtering process. So you won’t feel like a total jerk sipping fresh watermelon juices at the infinity pool post-massage; you’re really just doing your part to help protect this gorgeous place. It’s not always easy to give yourself permission to splurge or to justify spending a month’s rent on one night in paradise. And, yeah, I know I wasn’t actually shelling out my own cash—but I would love to come back here, because as much as I appreciate a $37 tree house, there’s something to be said for some extra pampering.